Black seed oil refers to the volatile oil of Nigella sativa, a flowering plant native to southwestern Asia and cultivated elsewhere. 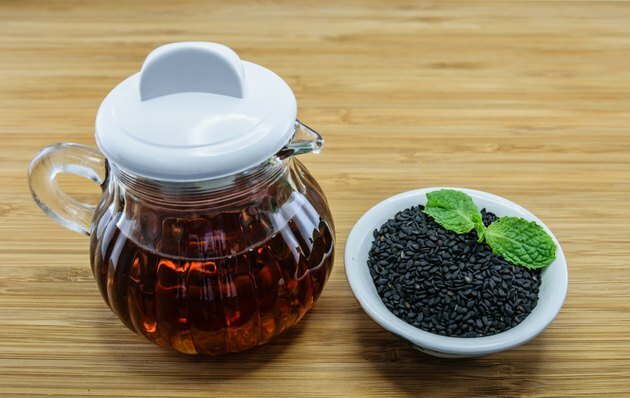 Black seed oil has a long history of use in medicine dating to ancient Egypt. Traditionally, the oil is used to treat respiratory and inflammatory disorders. The oil is also an abundant source of fatty acids and a substance called thymoquinone, which is being studied as a potential anti-cancer agent. Before using black seed oil for any purpose, consult your doctor. The seeds of Nigella sativa, locally known as “kalonji,” are used to flavor liquors, breads and pastries, most notably a popular flatbread known as Peshawari naan. The seeds are also known by a variety of other names, including black caraway, nutmeg flower, black sesame, Roman coriander and black cumin. However, many of these common names are random and misleading. For instance, black cumin is a legitimate spice derived from Bunium persicum, an entirely different species. Nutmeg, caraway, sesame and coriander are also unrelated. In the Yunani system of medicine practiced in India, N. sativa is traditionally used to treat gastrointestinal complaints, parasitic infections and chronic skin conditions, such as psorisis and eczema. Black seed oil also commonly is used to treat inflammatory disorders, including arthritis, rheumatism, asthma and bronchitis. Black seed oil contains numerous chemical compounds. Among its active ingredients are the antioxidants beta-sisterol, nigellone and thymoquinone. The oil also contains selenium, iron, arginine, carotene, calcium, potassium and several amino acids, including a high level of linoleic and smaller amounts of oleic, palmitic and stearic acids. Black seed oil also contains a type of plant saponin called melathin, which contains a significant amount of mucilage. According to a paper in the June 2005 issue of "Food Control," black seed oil effectively counters 20 different strains of Listeria monocytogenes, a foodborne bacteria pathogen responsible for spreading listeriosis. The study authors attribute this effect to the presence of nigellone. Thymoquinone exerts antioxidant, anti-inflammatory and analgesic effects. Specifically, it inhibits the production and release of certain prostoglandins, hormone-like agents that are involved in activating pain and inflammatory response. Researchers from King Saud University in Saudi Arabia who reviewed the numerous nutritional components of black seed oil, reported in the April 17, 2003 edition of "Phytotherapy Research" that thymoquinone compounds also improve respiration, reduce blood pressure and decrease serum levels of glucose, cholesterol and triglycerides. In addition, according to an article provided by PhysOrg.com, researchers at Thomas Jefferson University in Philadelphia have found evidence that thymoquinone promotes apoptosis, or programmed cell death, in pancreatic cancer cells. The topical application of undiluted black seed oil may cause skin irritation in some people. Otherwise, as the authors of the 2003 study published in "Phytotherapy Research" noted, black seed oil has a very low degree of toxicity and the internal administration did not produce negative effects on the liver or kidneys. However, the safety of black seed oil during pregnancy or lactation has not been established.